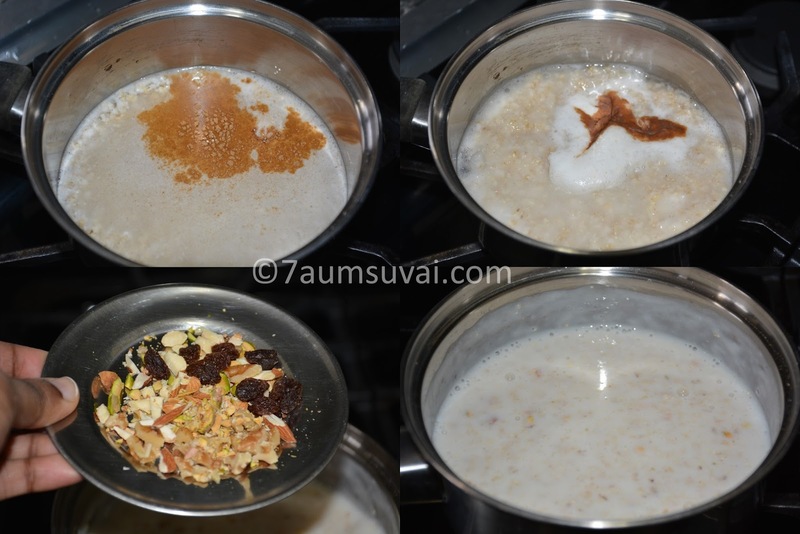 Oats porridge, quick porridge prepared with instant oats or 1-minute oats along with milk and chopped nuts. I am not the big fan of oats. But, we need some alternative for bread and cereal. So I started preparing oats porridge with nuts and cinnamon powder. Even my daughter loves to have for breakfast. Take a pan, add oats, 3/4 cup of water, cinnamon powder and powdered palm jaggery or sugar, bring it to boil and cook until the oatmeal is well cooked. Add milk, give a quick mix and continue to cook for another 2 minutes. Finally add chopped nuts along with raisin and switch off the stove, serve hot. You may replace instant oats with steel cut oats. You may replace palm sugar with our regular sugar. I have used powdered palm sugar (just grind palm sugar and sieve it). You may increase or decrease the amount of milk and water as per your consistency. I have used chopped almonds, pista, walnuts and few raisins.